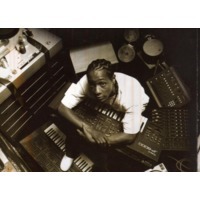 David Martin Blake (born January 18, 1970), better known by his stage name DJ Quik, is an MC and record producer. According to Quik himself, his stage name reflects his ability to produce records in short time. Blake has written, produced, and remixed music for many artists including Snoop Dogg,Whitney Houston,Mariah Carey,Talib Kweli,2nd II None,Chingy,Xzibit,Janet Jackson,Jay-Z,Ludacris,Suga Free,Kurupt,Truth Hurts,Jermaine Dupri,Hi-C,8Ball & MJG,Eazy-E,Ray J,Tony! Toni! Tone!,2Pac,Jay Rock,Busta Rhymes,Nate Dogg,Bishop Lamont,Shade Sheist,Game,Murs,E-40,Knoc-Turn'al,Erick Sermon,Luniz,Adina Howard,Shaquille O'Neal,King Tee,Yung Joc,TQ,Deborah Cox,Twiztid,Maroon 5,Danny Boy,Nick Cannon,Bone Thugs-N-Harmony,Ice Cube,Jon B. and many others.